News From BiNet USA co-founder Lani Ka'ahumanu: "One of our dearest most brilliant, fierce, outspoken, loving, gentle, and fun/ny queer bisexual beings The Reverend Dr. Ibrahim Farajajé has passed." 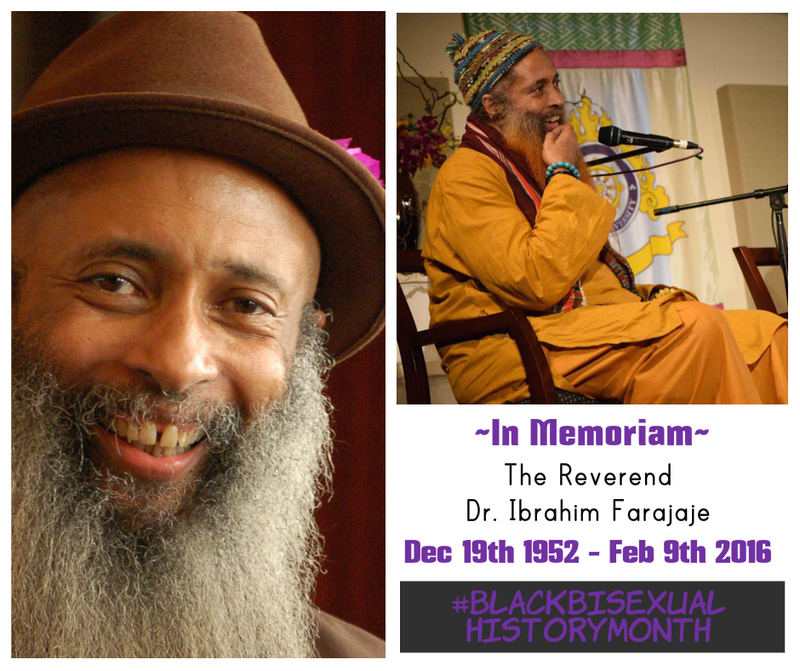 BiNet USA chooses to honor Dr. Farajajé on our first ever #BlackBisexualHistoryMonth shareable image. Download full size. A towering talent, an intellectual genius and a kind hearted teacher beloved by many, Dr. Farajajé's writing on the decolonization of queer theory "took off where Audre Lorde left off". Like Lorde and her dear friend the Black bisexual poet June Jordan, Dr. Farajajé transitioned too soon from this life to the next. We extend our deepest condolences to Dr. Farajajé's partner Katherin and his son Issa, as well as his adopted son Kuji Mah Ajani during this difficult time. During his life, Dr. Farajajé was an inspiration to many different communities, and many of our elders mourn a great loss in the passing of a founding father of bisexual movements. 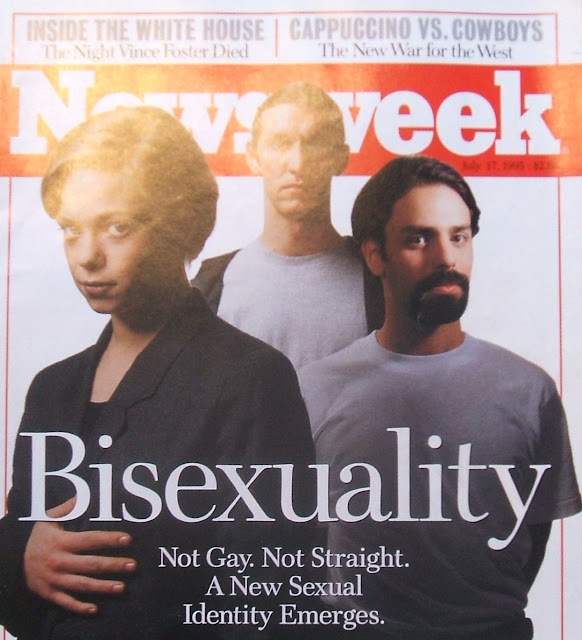 In 1995, Dr. Farajajé and his family were featured in a groundbreaking cover story on bisexuality for Newsweek. In 1994, Ka'ahumanu, Elias Farajajé-Jones, Laura Perez, and Victor Raymond, all from The Indigenous Queers/Bisexual Caucus, presented “Preaching to the Perverted or Fluid Desire,” at the National HIV Prevention/Education Summit held by the Association of Physicians for Human Rights (now the Gay and Lesbian Medical Association). In 1996, “What's bisexuality got to do with it?” training was held in conjunction with California's Lesbian, Gay and AIDS LIFE Lobby and Institute. It was coordinated by Ka'ahumanu, Stephanie Berger, Elias Farajajé-Jones, Felicia Park-Rogers, Brandon Taylor, Roland Sintos Coloma, and Cianna Stewart. In 1999, the Center for Disease Control/UCLA School of Nursing hosted a Bisexual People of Color HIV Prevention and Education Summit that was conceived by Bill Wedin and co-coordinated by Ka'ahumanu, with Elias Farajajé-Jones, Ron Fox, Karl Hamner, Dominique RosaNegra Leslie and Cianna Stewart. In 1998, BiNet USA hosted a National Institute on Bisexuality HIV/AIDS Summit with the National Gay Lesbian Health Association Conference, along with Ka'ahumanu, Lynda Doll of the Center for Disease Control, and Elias Farajajé-Jones, Luigi Ferrer, Ron Fox, Dr. Fritz Klein, Marshall Miller, Cianna Stewart and Joe Wright. Most recently Dr. Farajajé served as Provost at the Starr-King School For The Ministry in Berkeley, CA, where his areas of focus included "digital media; Shi’a studies; intersectionality; bodies and performances of embodiment/genders/sexualities/identities through ritual, constructions of ritual space, environmental politics and aesthetics within religious contexts; politics of identity; post-colonial/decolonial/transmodern theory; Islamic cultural studies and critical theory; Islamic feminisms; Andalusian studies; Bosniak Islam; Islam and the African diaspora in the Indian Ocean world; Alevi studies; history of Sufism in Turkey; history of Islam in India; Hindu-Muslim relations; histories of Mizrahim, Sefardim, and other Jewish communities; Jewish and Islamic mysticism; Eastern Orthodox and Islamic mysticism (Hesychasm and tasawwuf); ritual music; Islamic environmental studies; global HIV; popular culture and Islam; and notions of the “border” and of fluidities". While he's no longer accepting messages on this plane, you can still peruse Dr. Farajajé's CV, it also functions as a handy reading list for any gender, sexuality or religious ground breaker or barrier buster. Bi+ Pride at HRC's "Time To Thrive"